What they lack in size, they make up for in beauty and spiritual impact. Throughout the landscape of Western Europe (in particularly England), larks have inspired the hands and minds of the world's most talented poets and painters with their pleasant chirps and melodious birdsong. Writers like Chaucer and Shakespeare often used the image of the Lark to symbolize a dawning of new opportunities in their literary pieces. Ever since the earliest days of Old World Europe, these birds were seen as messengers that bring Hope and Prosperity, and this idea has crossed over into many aspects of the New World. Despite the fact that only one member of the Lark family is native to North America, larks have a prominent place in tribal culture. To the Lakota, they are seen as messengers of the god of the South Wind god, Itokaga, who brings life, light, and warmth to the world. In Christianity, the Lark has come to represent Jesus Christ. Lark designs are also symbolic of Femininity. Through the bird's distinct crescent on its chest, mankind has been linked with the Lark with the phases of the Moon - one of the ultimate natural symbols of womanhood. The Lark's well-defined family structure and seeming devotion to its relatives had made it a totem of Family and Love as well. Regardless of where life's journey takes you, the presence of the Lark is a sign that only the best will be bestowed on you and yours. 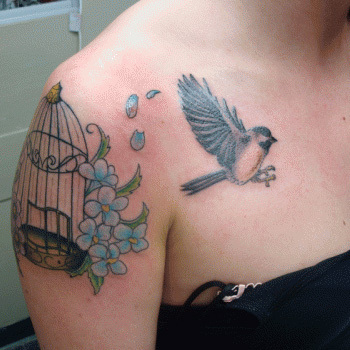 Lark Tattoos usually embody colourful elements to play up the cheerful associations of the bird. They are one of the few birds that can simultaneously sing and fly, as such, they are amongst the most beloved of the avian species. A lark is a sign of Fortune and Family, as such, many artists will incorporate elements that draw heavy reference to both these teams. A Lark Tattoo is a great way to show off your sweet, cheerful disposition and lets the world know that, despite the difficulties, you see the sunnier side of life. When venturing into the world of Tattooing, whether as a newbie or seasoned pro, there are a few foundation elements that are integral to your design choices. What does each element symbolise? Where will the design look best on your body? Does it convey the image and vibe that you are looking for? Tattoos cannot be erased with magic erasers and wishful thinking, as such, it pays to take your time to get the details of the design perfect. If you need inspiration or even customized designs, then take advantage of our Custom Design Service, where our team of highly skilled artists will be more than happy to help design a truly unique piece for you.